In November, AURIN proudly presented a seminar for researchers and urban planners by world-renowned British urban planner and geographer Mike Batty (Professor of Planning, University College London). His visit to Melbourne was made possible through a partnership between AURIN and CSIRO. In this talk, Professor Mike Batty explored how cities change qualitatively in terms of their performance as they change in size. Essentially cities like many animal species change qualitatively as they get bigger. Not only their shape changes but so does their performance across a range of indicators. We live in an era when big cities are being favoured much more than small and these ideas suggest that if you live in ever bigger cities you will reap ever bigger rewards. In fact this is an extremely controversial idea and it is weakened by increasing globalization and by the fact that big cities also seem to attract greater income inequalities. Our argument here turns on ‘how we define a city’ spatially which is an age-old problem. 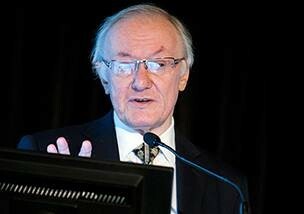 Professor Mike Batty will illustrate how we are addressing this problem using percolation theory where we explore how we fracture up a nation into regions and cities across many levels of hierarchy and in so doing produce thousands of city definitions, most of which refute the notion that big is better. We do this for UK cities. Others have shown the opposite from standard definitions of cities in other countries but our approach builds cities from the bottom up giving much greater flexibility in defining meaningful entities. Michael Batty is Bartlett Professor of Planning at University College London where he is Chair of the Centre for Advanced Spatial Analysis (CASA). He has worked on computer models of cities and their visualisation since the 1970s and has published several books, such as Cities and Complexity (MIT Press, 2005) which won the Alonso Prize of the Regional Science Association in 2011, and most recently The New Science of Cities (MIT Press, 2013). His blogswww.complexcity.info cover the science underpinning the technology of cities and his posts and lectures on big data and smart cities are at www.spatialcomplexity.info . His research group is working on simulating long term structural change and dynamics in cities as well as their visualisation. Prior to his current position, he was Professor of City Planning and Dean at the University of Wales at Cardiff and then Director of the National Center for Geographic Information and Analysis at the State University of New York at Buffalo. He is a Fellow of the British Academy (FBA), the Academy of Social Sciences (FAcSS) and the Royal Society (FRS), was awarded the CBE in the Queen’s Birthday Honours in 2004 and the 2013 recipient of the Lauréat Prix International de Géographie Vautrin Lud. This year 2015 he received the Founders Medal of the Royal Geographical Society for his work on the science of cities. During Mike’s visit to Australia, he also spent time at the CSIRO sharing his expertise with the Cities Research Program team. Read his discussion with program leader Greg Foliente on the question of What will our cities look like in the future? This entry was posted in Latest News, Transport, Urban Development. Bookmark the permalink.